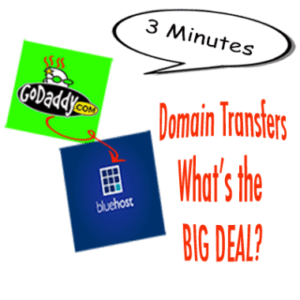 Transferring Domains From GoDaddy • What's the big deal? Update 2016 – GripCurrent Now does High Speed Optimized Hosting as part of Our Monthly Package! Transferring domains seems like such a pain when you read others experiences. It wasn’t for me. I’ve been using Bluehost as my hosting company for almost a year now. I really have no complaints, other than a little trouble with my initial WordPress site installs. I originally tried to speed up the “Going Live” process by using their quick MOJO marketplace install and another quick install feature. The steps just over complicated the process. Now I just dump the whole site on via ftp; but I digress. After reading some message boards and blogs it seemed transferring domains from Go-Daddy or anywhere really, was a troublesome experience for most domain owners. Not to say it is easy with other services. So I procrastinated, put off, and basically didn’t get around to transferring my domains for months after I wanted to. I didn’t feel like having to be involved in a customer service holding pattern or have my domains out in lala land because of renewal locks or whatever other problems people blog about. After some well planned setup, today I finally transferred 9 domains to bluehost in about 30 minutes, 30 days before renewal. A lot of the problems with transferring domains has to do with initial setup. The privacy setup for your domain can add time and pain to your transfer – leave 48 hours in between changing your domain privacy and domain transfer. When you purchased your domain did you set it up with Privacy? If you did you must enter your GoDaddy account to find access to your privacy account and turn it off. This may take some time depending on if you know how privacy works. I didn’t when I setup my initial account with GoDaddy and they use a separate entity to hold privacy account settings (domainsbyproxy). If you don’t know what the Username and Password is, it may take a day or two to get control of these settings by entering your information and going back and forth with GoDaddy reps on the phone. Luckily GoDaddy’s customer service has been getting better and turning off privacy is just a waiting period you have to deal with. If you know your Username and password than go into your account and turn off privacy. Make sure all the info is changed and correct for your domains to transfer. Go to GoDaddy.com and enter user account. If you forget your username it is usually an account number not a email address. If you know your pin they have the “forgot your password” link that will give you an account number; or call customer service with your billing information. Enter Products and hit Launch on Domains, click on the domains you wish to transfer. Follow directions for canceling privacy. This directed me to DomainsbyProxy.com. Follow instructions to log in and change settings or follow instructions for gaining access. This may include multiple back and forth emails, call customer service and try and push things through. The squeaky wheel gets the grease. Now you wait – Don’t figure that this will be fast unless you have all your account numbers and passwords. It took them 3 days to complete the privacy change for me. Make a Back-up of your site (and database) on your local via FTP and phpMyadmin and upload it to your new hosting company. I use FileZilla for FTP transfers. Many hosting companies have an FTP client built into c-panel you can use. Find out your FTP hostname, username, and password and log in. Drag you sites folder onto your local disk. If you use a database make backups of them on your local. Upload to them to the new hosting company (access phpMyadmin in c-panel). You may have to go through some different steps if you are trying to switch just to a new primary account (not just adding on). Bluehost will ask you your domain and all the contact info and plans you want to buy. Find out what the name-servers are for your new hosting account. If you don’t have a new hosting account make one. Bluehost allows you unlimited domain add-ons for a shared server account, this is why I use them for domains that don’t need a ton of added speed and features. Log into your account and click on domains. The summary box on the bottom right, has a tab for the name servers – usually ns1.bluehost.com and ns2.bluehost.com. If you’re making a new account, swapping a GoDaddy domain to a master or top level domain. You may have already done this in your initial account setup. Log into GoDaddy and change your domain name servers to your new name servers. This will kick your domains name-servers over, this takes about two days to complete as global whois registries adjust to your new name servers. Wait 48 hours for changes to go through completely. If you have site files uploaded, it may take a while before everything is displayed correctly, maybe a few hours or more. Your site may be down for some time. If using databases (WordPress) don’t forget to change your database name, host, username, and password in your config file; pointing them to the correct database. Transferring Domains from GoDaddy to Bluehost in about 3 minutes a piece. So you finally have the 2-3 day process of domain setup/free-up/foreplay done (turning off privacy, setting up your new hosting account, swapping name servers), but your domains are still registered at GoDaddy. Good news the rest is easy. Double check all name-servers are pointed to the new host. Double check privacy is off and all your whois information is correct. Log into GoDaddy, Bluehost, and the e-mailbox/s you use for the two accounts in separate windows. On GoDaddy Launch Domains, Click on 1st Domain you wish to transfer, Click on send authorization code (at the bottom of the options). On Bluehost, Go to Domains and click on transfer a new domain to this account. Receive an emailed EPP/Authorization code from GoDaddy and cut and paste into Bluehost. Click enter. Receive Email Authorization code from Bluehost and cut and paste into BlueHost. Click Enter. Fill out options Yes/No privacy and click on accept terms and conditions. Click Enter. Domain transfer is added to shopping cart. Repeat Steps 4-9 for every domain you wish to transfer. GoDaddy will send you an email asking if you wish to cancel or accept transfers. Go into GoDaddy’s Launch Domains, above your list of Domains click on the Domains Tab and hit the Transfers drop down tab. Accept all Transfers in next window. You will receive a confirmation via Email for both GoDaddy and Bluehost. So that’s it. What’s the Big Deal and why is Transferring Domains from GoDaddy seen as such a painstaking process. Don’t tip off your old hosting company’s customer service that your leaving, until after everything is completed. Don’t jump the gun on the 48 hours it takes for name-server pointing and privacy. Make sure you have a working backup of your site with databases on your local before you start anything.